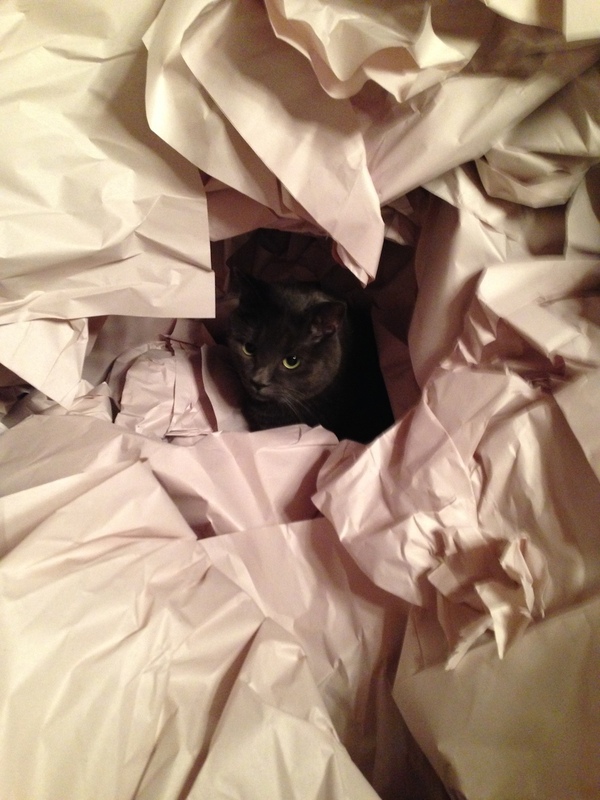 All it takes to entertain Miss Mia Sopaipilla is a pile of wrapping paper the size of a former Amazonian rain forest. Thanks, Mayflower! This entry was posted on October 2, 2014 at 7:55 am and is filed under Albuquerque, Cats. You can follow any responses to this entry through the RSS 2.0 feed. You can leave a response, or trackback from your own site. And of course the packing boxes. Like a kid, plays with the box the toy came in more than the toy itself? Gee, I wonder what you are doing today? Hope all goes smooth. For me the only thing worse than moving in is moving out! I’m currently grabbing stuff from our Northern Italian HQ to drag down to Rome early next week. The upside is I will finally have some different clothes to wear AND bikes to ride!!!! Maynard Hershon arrives tomorrow and I hope to talk him into doing the 75 km ride at l’Eroica instead of the longer one so we don’t have to get up at O dark:30 AM to start. Some of these kooks start in the dark for Pietro’s sake!!!! I’m too old for that crap! Say hello to Maynard for me. Also, tell him I got those earplugs! Will do, I’m on my way to the Pisa airport this AM. Should have some pics and stuff on the CycleItalia blog soon, perhaps after Saturday’s registration, expo, etc. hahahah, hilarious! I cannot stop laughing- you captured that look in her eye perfectly, as she waits to jump/pounce again! “Maynard Hershon” I didn’t know he was still around, brings back Competive Cycling days. Saw him and Tamar in Santa Fe last January, when they came down from Colorado and I rode the BMW down from Bombtown. Still looking like he could play whoopass with most of us on a two-wheeler. You can read Maynard’s recent work at Bicycle Paper, they’ve got it all online nowadays. The elusive Mia makes an appearance! Perfect! Miss Mia! Blue Rooskies are truly beautiful felines. Jump on him Mia! Make him roll in the paper with you! Such a cute kitty. They do love paper and boxes! Cute photo. I hope the unpacking is going well. Interest post Larry. That Bianchi turned out nice. I am the same way as Maynard when it comes to helmets. It is hard for me not to wear one after watching my brother split a brand new Bell Star when he crashed at a mile flat track race in Heidelburg, PA back in the late 60s. By the way, I think my brother may have met Maynard. He told me the name sounded real familiar. His name is Bill O’Brien, expert number 63P and 99, and he raced with Bart Markel, and all the others like Neil Keen, on short and flat tracks during the 60 and early 70’s. Maynard’s a great guy. Funny thing about the helmet/safety issue – Maynard was aghast at the close encounters of the automotive kind on the roads as we drove around Tuscany in our rental van. My wife pointed out that traffic deaths per capita in Italy are well below the US of A despite what it might look like to the newbie. Hershon was a little skittish on the bike on these roads too at first, but based on email messages since we left him in Tuscany post-Eroica, he’s getting the hang of it…and starting to really enjoy it. And it seems even the BikeSnobNYC has a great time, though we never saw him amongst the 4000 or so participants.